If you are new to gardening or to this area, we would like to welcome you to Fairview’s newsletter and to Zone 7B. We try to help you succeed with your gardens and give you information to make gardening easier. The hardiness zone map is one of those tools. Q. What is a Hardiness Zone? A. A hardiness zone is a geographically defined area in which a specific category of plant life is capable of growing, as defined by climatic conditions, including its ability to withstand the minimum temperatures of the zone. Q. How are hardiness zones determined? A. Hardiness zones are based on the average annual minimum temperature in a given area. Each of the map’s colored zones is separated by 10 degrees and divided into subzones A and B, separated by five degrees. The U.S. Department of Agriculture mapped out the cold hardiness zones to show tree, shrub and perennial plants survivability. On the plant tags the zone information is spelled out as a range—USDA Zones 4-7. If a plant does not have numbers on the tag to show you zone range, chances are the plant is not hardy in your area and is intended to be grown as an annual. The Southeast needs to consider the heat and humidity. 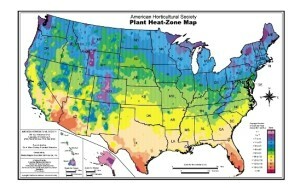 The American Horticultural Society’s heat zone map rates plants according to their ability to withstand excessive heat. When using these two maps together, you can determine both the cold and heat tolerance of your plants. For those of you who are new to gardening, along with the importance of climate, you will need to provide your plants with good soil, know the exposure (full sun, part sun, full shade or part shade), water requirements and fertilizer. We can help you with all of that! Just give us a call at 919-851-6821 or send us an email at news@fairviewgardencenter.com. The best part of gardening is creating a beautiful area in your yard where you can use your imagination and enjoy what you have done.